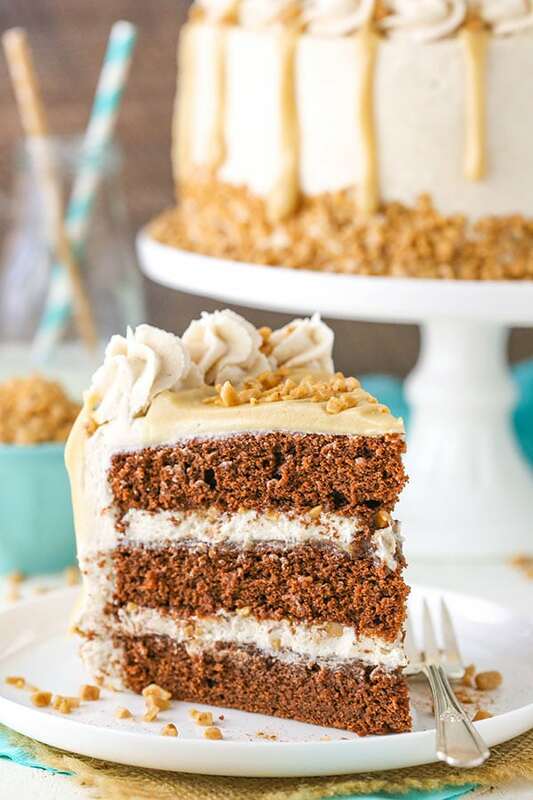 This Bourbon Spice Toffee Layer Cake is one of my favorites! I’ve made it several times and I think I love it more and more every time! The combination of chocolate, toffee, maple, cinnamon and the spice from the bourbon are a party for the taste buds and perfect for celebrating today – the one year anniversary of the release of my cookbook! So this is a big week for us around here. The first thing going on is that we figured we didn’t have enough to do with planning for twins and decided to buy a house and move. We’ve totally lost our minds! You may remember that we’ve been looking at homes for almost a year now, but we put moving on hold when we found out we were having twins. Well, a couple weeks ago, a real estate agent we’d been working with let us know that the model home in a neighborhood we almost bought in last year was going on the market that night. We knew it’d go fast, so we went to look at it again the next day and see if we would really want to make the move. The fact that it’s so move-in ready is a big plus for us right now. They got three offers over the next couple of days, including ours. I was convinced there wasn’t a chance we’d get it. We loved the house, but with so much going on we weren’t really willing to be terribly aggressive. But to my surprise, we got the house! And now it’s a whirlwind trying to pack and get ready to move and sell our current house. Especially considering I’m limited in what I can do, being so pregnant. We’ve spend the last couple of weeks packing and getting things ready and the house will be on the market by the end of the week. Let’s hope it sells fast! I’m ready to move on and get ready for these babies! The other thing going on this week, which is really more of a celebration than anything, is that today is officially the one year anniversary of the release of my cookbook, Simply Beautiful Homemade Cakes! It’s hard to believe it’s already been a whole year! I have wanted to share this cake with you for forever! It’s seriously one of my faves from the book. It might seem like there’s a lot going on, but it all comes together in the most amazing cake. Like seriously, so good. The chocolate cake isn’t as intense of a chocolate, which is perfect with everything else going on. It’s also a little denser of a cake than mine usually are, but I really enjoy it in this cake. It’s got the flavor of the bourbon baked right in there too. And if you’re thinking you may not be into this cake because you don’t drink bourbon, think again. I totally do not drink bourbon – I leave that to the hubs – but I do steal it and put it in baked goods. A good spiced bourbon adds so much flavor! You don’t so much taste the alcohol as you do that spiced flavor. Love it! The frosting is a maple cinnamon frosting and it alone is good enough to eat with a spoon. Then there’s the toffee sauce made with brown sugar and a touch more bourbon. Drizzle that stuff on everything! And the toffee bits? Yes, please! 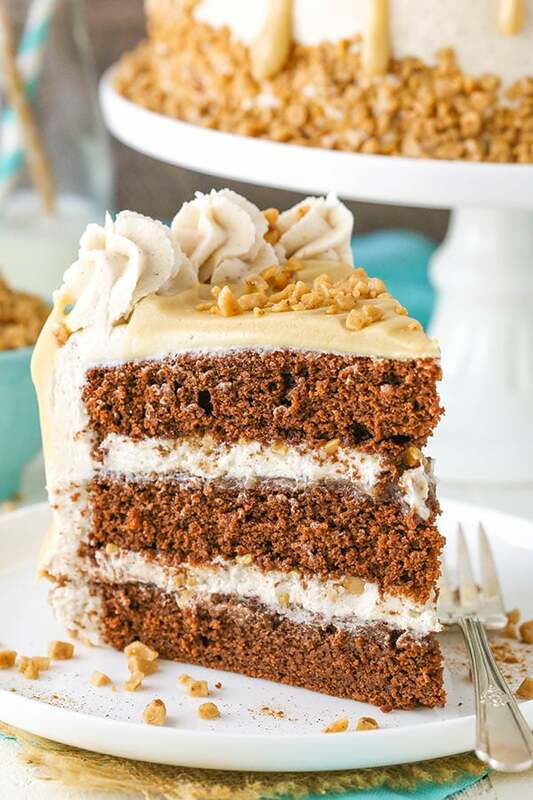 Layer them all together and it’s seriously heaven in a cake. 1. Preheat the oven to 350°F (176°C). Line the bottom of three 8 inch cake pans with parchment paper and grease the sides. 2. In a large mixing bowl, combine the flour, sugar, cocoa powder, baking powder and salt. 3. Combine wet ingredients in another medium sized bowl, then add to the dry ingredients and beat on medium-low speed until well combined. The batter is thin, so be careful of splashing. 4. Divide batter evenly between the cake pans. 5. Bake for 23-26 minutes, or until a toothpick inserted in the middle comes out with a few crumbs. 6. Remove cakes from the oven and allow to cool for 3-4 minutes, then remove from pans to a cooling rack to finish cooling. 8. Slowly add about half of the powdered sugar and beat until smooth. 9. Add cinnamon, maple extract and 3 tablespoons of water or milk and beat until smooth. 11. Add additional water or milk a tablespoon at a time as needed to get the frosting the right consistency. 12. To make the toffee sauce, melt the butter and sugar over medium heat in a large saucepan. 13. Slowly bring mixture to a boil allowing the sugar to dissolve, about 10-15 minutes. 14. Once it begins to boil, slowly add the heavy whipping cream and bourbon, whisking constantly. The mixture will be bubbly. 15. Whisk for 2-3 minutes, allowing it to come back to a boil. Once boiling, stop whisking and let it boil for 1 minute. 16. Remove from heat and whisk until smooth. Add the flour and whisk until smooth. Set aside to cool a bit. 17. To put the cake together, use a large serrated knife to remove the domes from the top of the cakes. 18. Place the first layer of cake on your serving plate or a cardboard cake circle. Spread 5-6 tbsp of toffee sauce evenly onto the cake layer. It should soak into the cake a bit. 19. Pipe 1 cup of frosting into an even layer on top of the toffee sauce, starting along the outside edge and spiraling inward. With the toffee sauce on top of the cake, spreading will be tough, so piping works best. 20. Sprinkle 2 tablespoons of toffee bits evenly over the frosting. Repeat process with the second layer of cake, toffee sauce, frosting and toffee bits, then add the final layer of cake on top. 21. Frost the outside of the cake with the remaining frosting, then press toffee bits into the sides of the bottom of the cake. 22. 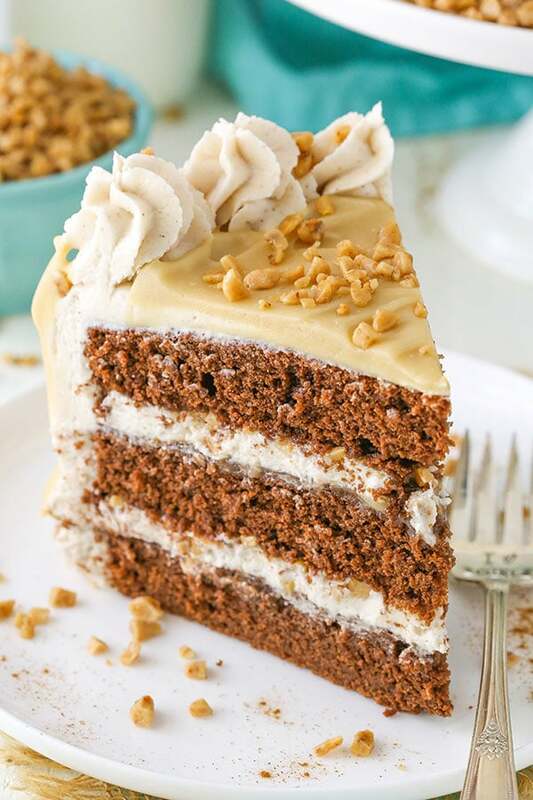 Pipe swirls of frosting around the top edge of the cake, then drizzle toffee sauce sauce the sides and fill in the center with more toffee sauce. Sprinkle with some additional toffee bits. 23. Refrigerate cake until ready to serve. Cake is best served at room temperature and is best for 2-3 days when well covered. Do you think cupcakes would work out for this recipe? You could try it. The cake itself is a denser one, so just expect that with cupcakes too. Wow! This looks fantastic! One question – I would REALLY like to make this cake but I’ll allergic to chocolate. I know, I know – the HORRORS!!! Anyhoo, could I substitute the cocoa powder with a white chocolate powder? If not, do you know of an alternative I could add? I know that it will change the consistency of the recipe if I leave it out so I would definitely need to replace it with something. Thanks! I wouldn’t suggest swapping out the cocoa – it normally changes the cake quite a bit. 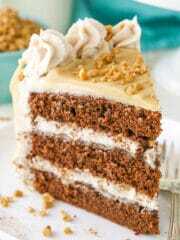 I’d try using a vanilla cake like this one and adding some bourbon to it. If you use that one, you could replace the water and some of the milk with the bourbon. I hope that helps! 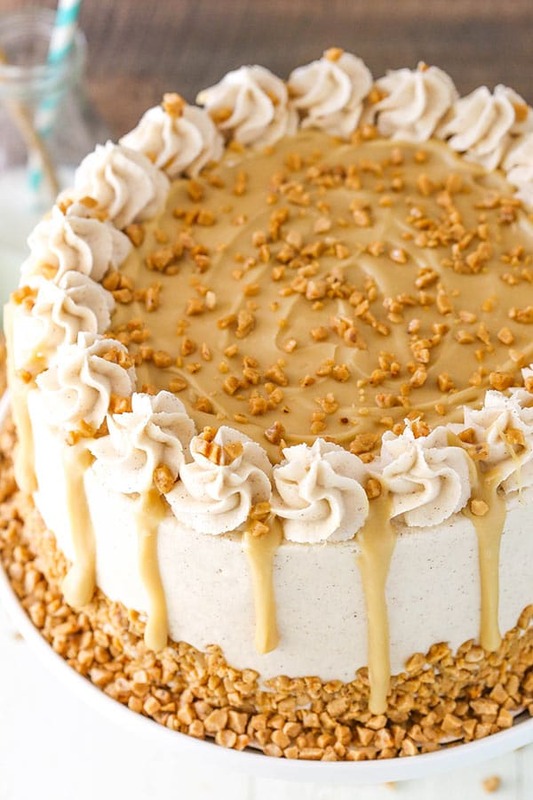 Wow, this toffee cake looks so delicious! I’m not that good with baking cakes, but I’ll just have to try this. Thanks for sharing the video and the recipe! Can this recipe be made as cupcakes? We’ve had the cookbook since it came out and love it. I can’t believe how much has happened for you all in that year. ???? We’ve got a family birthday coming and the kids love choosing their cake from your cookbook. Have fun settling into the new house!! Hey Jennie! I know – I can’t believe it’s only been a year either! So much change! I hope they love the birthday cake and that all is well with you guys! Could you use maple syrup instead of maple extract? I have some that I need to rid of. You could, but it wouldn’t give as strong of a flavor. Maple extract is much more concentrated. I haven’t made the cake yet, but I did make the toffee sauce to pair with a pumpkin layer cake. The sauce is good, but it lacks the rich, deep flavor of a true caramel. It comes together quickly and with little effort. It only took about 2 minutes for the butter/sugar mixture to come to a boil, and once the heavy cream was added, the mixture came back to a boil in less than 2 minutes. My sauce is the same color as the one pictured, but it seems to be a thinner consistency. Toffee sauce isn’t going to have the same deep flavor as caramel. They are different. If you’d like to make a true caramel sauce, I’d suggest this recipe. One of my favorites. If you’d like to thicken your sauce, you can always add a little powdered sugar. Just keep in mind that the sauce will thicken as it cools. Yes, it’s true. A toffee sauce like yours, which is made from brown sugar, butter and cream, isn’t going to have the same deep, rich flavor of a true caramel. I’ve made caramel many times, but was intrigued by the lengthy 10 – 15 minute cook time of your toffee sauce so went with it this time to compare. Most brown sugar/butter toffee sauces have a much shorter cook time, and I found that yours came to a boil much quicker than the recipe indicates. The tip about adding powdered sugar as a thickener is a good one. The sauce pictured on the top layer of your beautiful cake has a matte finish, which is common to toffee glazes and sauces where powdered sugar has been added. What would be the best brand of bourbon be for this? I have used Jim Bean and Jack Daniels and both were good. When I make this, I’ll use an Italian meringue buttercream instead of this American buttercream (especially because of the shortening you use in it). Everything else sounds fantastic, though. Thanks for the recipe. Certainly you can use an Italian meringue buttercream. However, it’s also very easy to swap out the shortening for additional butter. 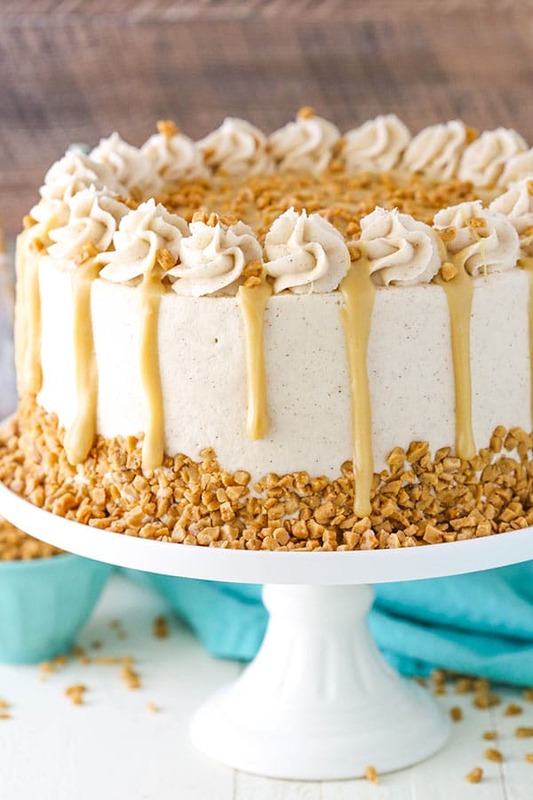 I had the same thought about the buttercream since I’m not a fan of American buttercream.I may do a swiss meringue buttercream, use less sugar, and add the maple syrup in at the end. I’ve done this before for a French toast maple bacon cupcake and it turned out amazing. I made this! WOW! I received so many compliments. Thanks. 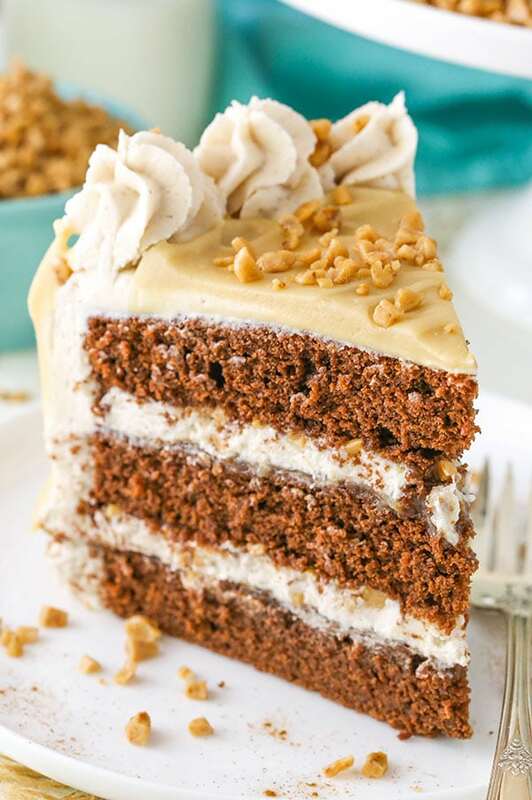 I would not make this cake into cupcakes (as it is dense), but would love to see that recipe ????. I had no problems with the sauce. Low and slow and it came out perfect. Even put the extra on Ice cream ???? Awesome! I love it too – SO glad you enjoyed it!! Again, another hit for our family. I made this for my son’s 20th birthday and everyone said that it was the best cake they had ever eaten…except for my son’s girlfriend, who doesn’t like it, but she loved your Cinnamon Swirl Cupcakes that I made especially for her. I did add one tablespoon of espresso powder and agree, probably not the best for cupcakes due to the denseness. Thanks again, Lindsay!!! Ugh… I just read my review… my son’s girlfriend doesn’t like chocolate. She didn’t try the cake because of that reason, hence the Cinnamon Swirl Cupcakes. Gotta read my stuff better before posting!!! So glad to hear it was a hit! And that the Cinnamon Swirl Cupcakes were too! I love both so much! I recently bought your cookbook and have just been drooling over all the recipes and pictures! I want to make them all!! I want to make this one for my family but I’m afraid they’ll be adverse to the fact that there’s actual bourbon in it (even if the alcohol gets cooked out). I’m wondering if it’s possible to substitute it for bourbon extract? Would it give it the same flavor? And if you think so, what would be the conversion amount for this recipe? Thanks in advance! Thanks Kortney! Glad to hear you’re enjoying the book! I haven’t ever tried Bourbon extract, so I’m not really sure about the flavor. You could swap out the bourbon in the cake for additional water or milk and then in the sauce, use additional heavy whipping cream. I’d think maybe 2 tsp of the extract in the cake and about 1/2 tsp in the sauce should be good. Just a guess though. Do you think a Swiss meringue buttercream frosting would work just as well for this cake? What measurements would you recommend for it? I really don’t make SMB, so it’s hard for me to say. 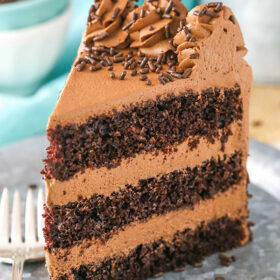 I will tell you that this cake is fairly dense with a lot of flavor, so if you think it would compliment it, give it a try! Hi quick question can you do a replacement for the shortening with any other ingredients? Making the cake for my birthday, and looking forward to sharing it with the family. Just use an equal amount of butter.